A Dog Water Bottle is Just What the Doctor Ordered? 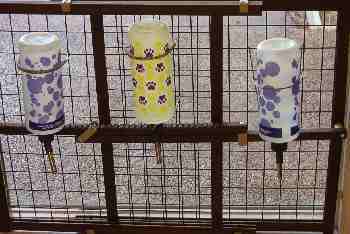 “Do they actually drink out of those water bottles?” a puppy buyer recently asked me during a visit to my home. She was referring to a water bar of sorts that lines one of my front windows. While my canine bar is not likely to be featured in the latest home décor magazine, it serves the purpose. 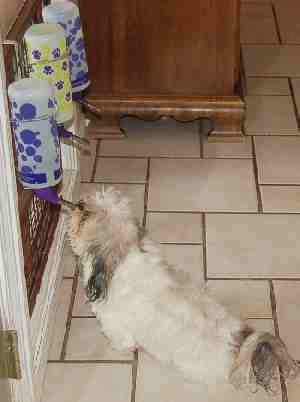 Why use water bottles instead of water bowls? One of the nicest features of the Shih Tzu breed is their face—almost human like, a puppy buyer once told me. Maybe not, but their chrysanthemum face is adorable--long whiskers and a beard, roundly trimmed to resemble a flower. But those long whiskers and beards can get very wet with each drink of water. Now, who has time to pull out the blow dryer each time their dogs takes a drink of water? Many Shih Tzu dogs have figured out how to drink with their tongues, but some of my dogs decided the only way to get a good drink is to submerge their entire head in the bowl. What resulted was a wet dog face. On a hot summer day, that wetness probably felt good to them, but those kinds of wet faces insisted on giving me wet kisses. Uck! Worse than a wet face was a perpetual blob of hair that began to radiate an odor that resembled mold. They had developed a fungal infection that wasn’t easy to treat. Their white hair turned a lovely shade of red-brown that didn’t wash out in the bathtub. Personally I prefer white hair on a white haired dog. I needed a quick solution. That is when I discovered water bottles. Do you have one of these underwater slurpers? A dog water bottle may be your best investment. How do water bottles work? Just looking at a dog water bottle, one might assume that it drips all the time, but luckily that is not the case. Each bottle has a vacuum valve. Whether you use a plastic or a glass bottle, they all feature a metal drinking tube with one or more metal ball bearings inside. The vacuum forms in the sealed bottle because the little metal ball allows a film of water to remain on the ball and the end of the tube. The small ball serves as the opening and closing of the metal straw. Two little balls inside the tube will keep the bottle from dripping at all. However, my experience has taught me that my Shih Tzu dogs have to work too hard to get the water out and will not use the bottles with two balls. Take one of the balls out, and they begin to enjoy a clean fresh drink. When the dog licks the ball, the water runs and the dog drinks. When the Shih Tzu stops drinking, the small ball settles back in place and the valve closes. You can see a droplet of water at the end of the tub after the dog leaves, but that does not mean that the bottle is leaking. Rather, the bottle is re-establishing the vacuum. There is a trick to setting up the bottle so it does not leak. You can mount it to any stationary surface that allows you to use the metal brackets that come with the bottle. Fill the bottle to the brim so there is little or no room for air. Replace the seal and tap the ball a couple of time to remove any water. Tapping helps equalize the vacuum pressure. Place the bottle at the height of your dog’s mouth so they don’t need to work too hard to get the water. Many bottles are available online and off, but the ones listed below by this manufacturer are the ones I recommend. They come in a variety of shapes, colors, and sizes. A 16-ounce bottle is fine if you have one dog, but if you have more than one, I recommend getting at least a 32-ounce bottle. The ones listed below can be purchased directly from Amazon, and Miracle Shih Tzu receives a tiny commission for any items purchased directly from this site. As always, we really appreciate your help. Some brands are better than others. The bottle cap must have a rubber gasket. If it is missing or damaged, the water will continually pour out. There must be a vacuum seal, so be sure to fill the bottle to the rim, allowing little or no air to remain. Tap a couple of times to remove any excess air. Place the bottle vertically in the metal brackets and tap a couple of more times to remove any more air. The dogs won’t get enough to drink. My dogs actually drink more out of the bottle because the water tastes fresher and clean. Tastes? Yes dogs, unlike humans, are one of those species that can taste water. Most dogs would choose clean over dirty water when given a chance. The dog won’t drink from a tube. Give it a try. My dogs were reluctant at first too. I put the bottle in place and introduced it to the dog. I encouraged the dog to sniff. Of course it had my scent all over the bottle. I then tapped the ball and demonstrated how the water came out. They licked the water from my fingers. We did that several times a day while still allowing them to drink from the bowl. Eventually all the dogs began to try it out. I still use containers where the bottles are impractical, but most prefer to drink from the bottle. According to the Lixit website,(did I mention that was my favorite brand), plastic bottles can be hand washed in soapy water and rinsed well. A bottle brush can be used to remove any “slime build up”. Lixit recommends that you clean your bottle weekly. You can disinfect the bottle and tubing with bleach, the same way that a commercial facility might do. Use a ratio of 10 parts water to one part bleach and submerge for at least 10 seconds. Air dry thoroughly before using. There are other types of disinfectants, but bleach is easy and readily available. Disinfecting is an added precaution against germs, but hot soapy water, followed by a hot rinse and air dry will kill most household germs. Use a small bottle brush to scrub inside the bottle and rinse out the metal tube daily. I try to have an extra bottle handy that can be cleaned and allowed to air dry between uses. If you use on a crate or x-pen, the bottle may drip if the dog moves or shakes the enclosure. If you are worried, place a shallow pan under the bottle to catch any small drips, if desired. Buying a Puppy from Me? Would you like me to begin training your puppy to drink from the bottle? Please let me know well in advance. Most puppies start drinking water from a bowl after four weeks of age.